1We will meet to discuss your thoughts and hopes for your birth. 2We will also do a complete history, physical, initial labs, class scheduling, and cover any questions or concerns. 3Monthly prenatal visits will follow until 28 weeks. 4Visits every 2 weeks up to 36 weeks, and weekly visits until the birth of your baby. 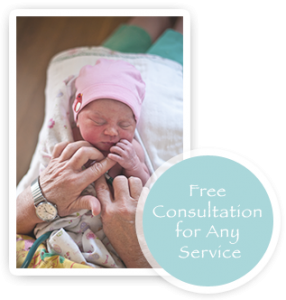 5Care throughout your labor, birth and early postpartum. 6Home visits at 24-48 hours after birth and as needed in the first two weeks. 7Your postpartum check-up in the office between 4-6 weeks. 1Classes for pregnancy, birth and breastfeeding. 2Support for labor, birth and early breastfeeding. to your family’s unique needs.